CCUG is a nonprofit organization under the North Valley Community Foundation. We started in 2010, when two members of Chico Ukulele Group realized their dream of passing along the joy of ukulele playing to children. 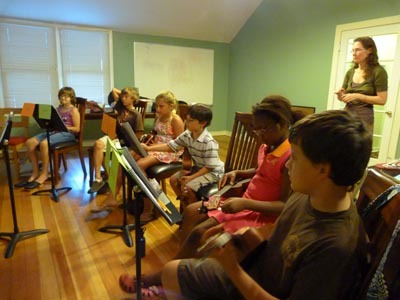 Today, CCUG teaches an after school music program at Trinity United Methodist Church. We also have established programs at Chapman Elementary School, Citrus Elementary, Rosedale Elementary, Parkview Elementary, and Neal Dow Elementary. A new program at Nord Country School is also in the works. CCUG’s vision is to provide music instruction to elementary level students in the Chico, California, particularly to schools where arts education is at risk due to budget constraints. Our music lessons are based on the Ukulele in the Classroom program which was developed in Canadian schools by renown ukulele virtuoso James Hill and J. Chalmers Doane. The idea is that the ukulele is an accessible, economical instrument for children to learn music fundamentals and appreciation. CCUG is dedicated to welcoming any student who is interested in learning to play the ukulele. Through generous donations made by the local community and philanthropic organizations, we offer partial or full scholarships.